We are currently being invaded by small creatures. And not in the garden, which would be bad enough, but in the house – hundreds of live and dead bodies about the windows, climbing the walls, and all within our living spaces. Welcome to Minnesota in the fall. This domestic drama all began with the wasps. 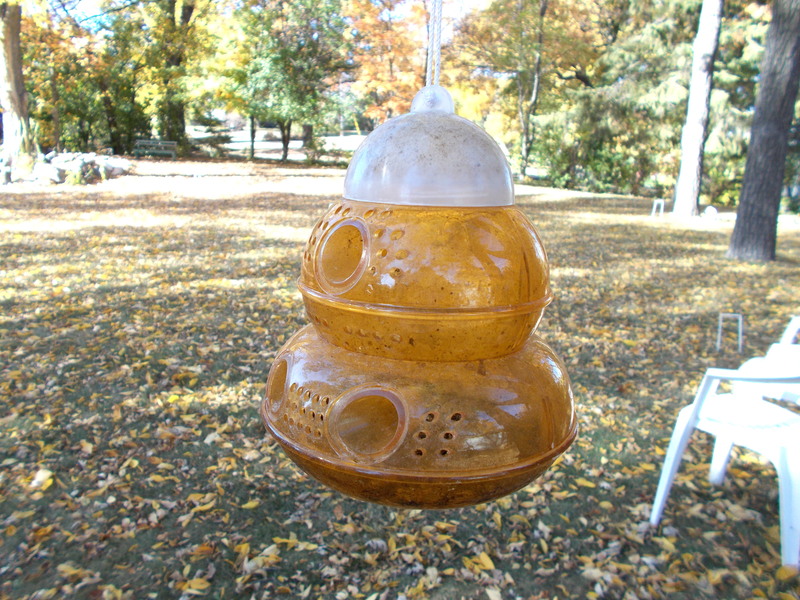 After trapping seemingly hundreds each day in our sweet juice-filled hanging bell in the garden, they just kept coming and coming and eventually came inside. 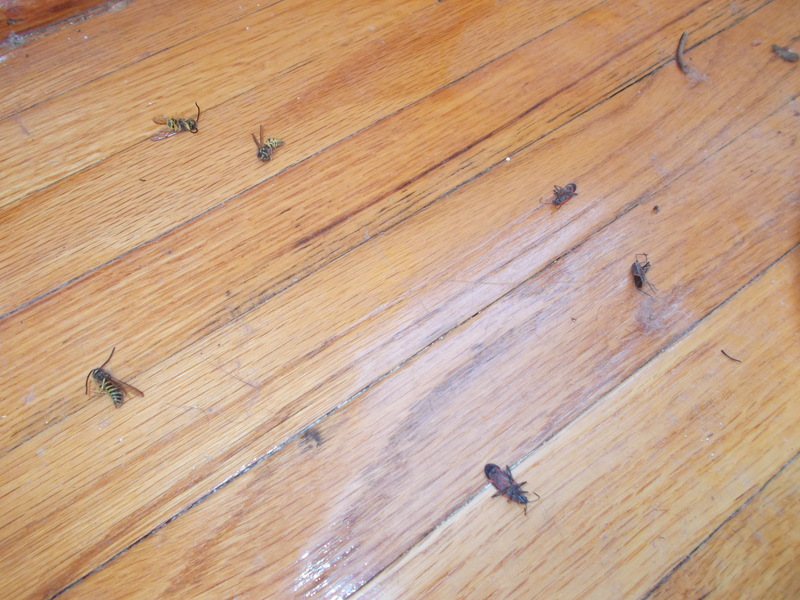 Every day since, I have vacuumed the bodies strewn about the sills and floor while swatting still active buzzers. However do they get in? I can see a teensy crack beside the portable air conditioner in the downstairs window. One small possibility, but hardly probable given their numbers. And why do they then, for the most part, just up and die? In research desperation mode, I discovered that one nest may contain several thousand wasps. No wonder we couldn’t kill them all. There are 100,000 species of this annoying pest and farmers actually like them because they eat disreputable bugs and caterpillars. I am a fan, it’s true, of what is called “integrated pest management” in horticultural circles, but we are not a farm and my garden is still small. Whether they be yellow jackets, paper wasps or hornets, they are able to squeeze beneath baseboards, under window and door frames, through light fixture and ventilators, as well as gable vents in attics. A credible achievement. 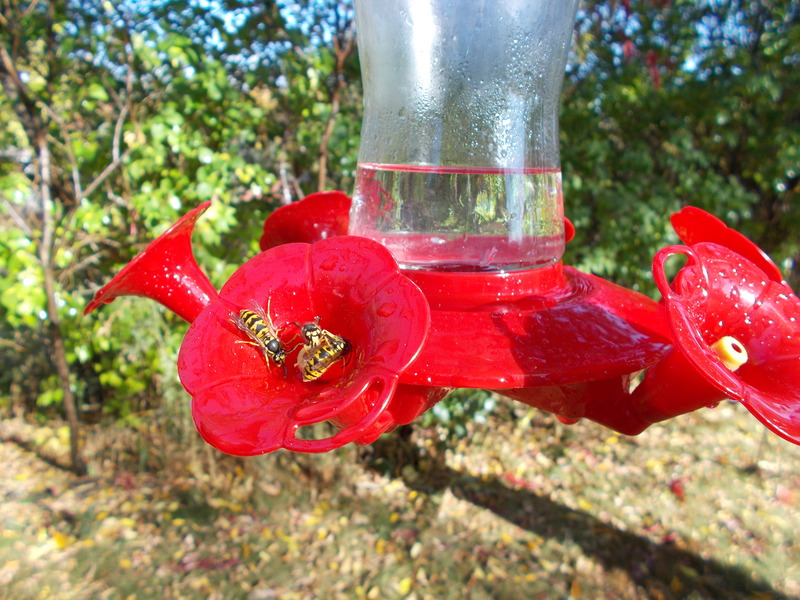 The queens need to over winter in a warm location, so that may attest for the handful of inside survivors. All the rest die off to be replaced next spring with new fertilizations. I’m guessing the multitude of dead bodies represent courtiers who have accompanied Her Royal Highness for the long winter nap. So that’s one mystery solved. But of course, now I know that our home on Mt. Faith has never been invaded by sweet Ann and her brothers, sisters and mom. 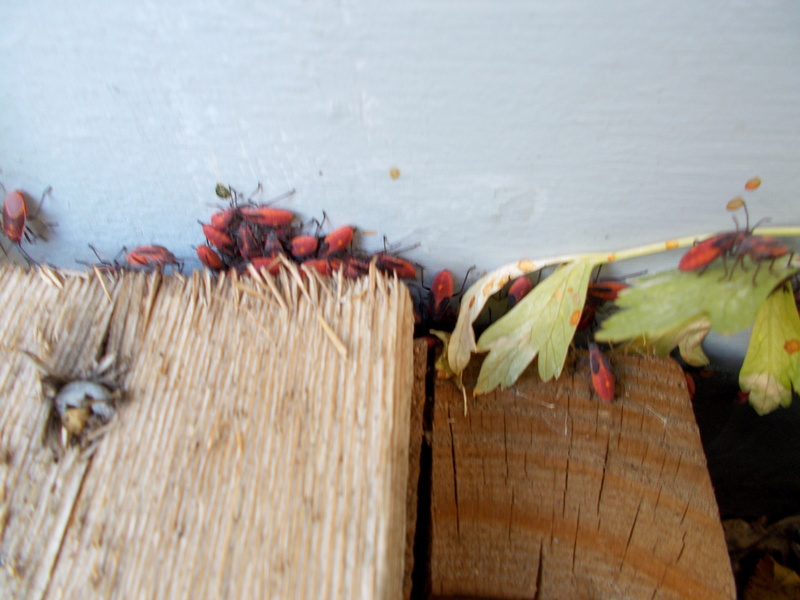 Not this, the lady bug of story, myth and gardener’s delight who aids in the eradication of aphid and scale. The Asian cousins, unfortunately imported in 1916 in an attempt to control pests, might happily lap up the nasty plant vermin as well, but they also break into domiciles without invitation or courtesy in the Fall. And they were no help at all in controlling the horrid red aphids which claimed my three nepetas all summer, in spite of a daily burst of garden water from the hose. And they’re not alone in their break and enter. 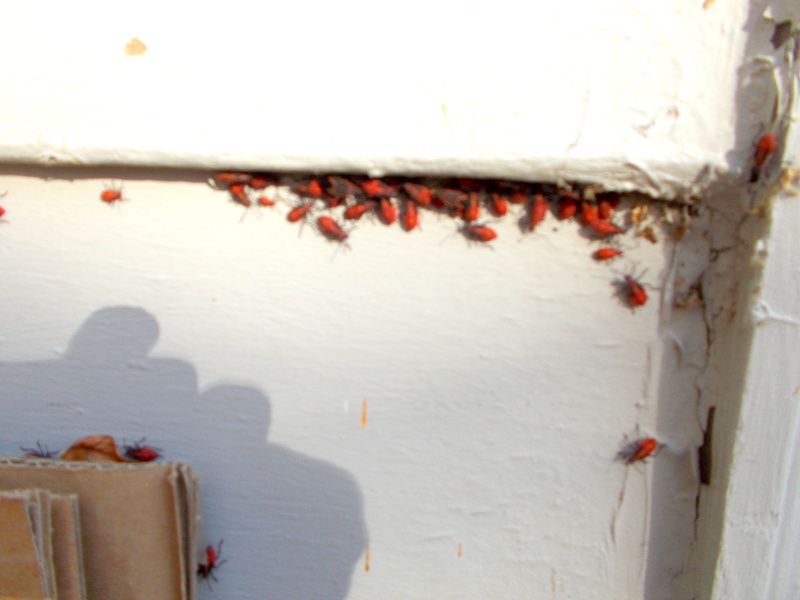 Even more invasive is the Box Elder Bug which, after sunning in large aggregations for months upon the maple and ash and elder, force ingress, also in order to over-winter. One interloper, just now as I type, is crawling upon the computer screen. Another buzzes about my head. A third actually falls, plop, into my wine glass. In my Googling I discovered that they are particularly attracted to buildings standing taller than others. Check. And that they will become more active and particularly cozy when the winter chill requires us to turn up the inside heat. Uf Dah! In the meantime, I need to keep reminding myself that at least (being this IS Minnesota) it isn’t grasshoppers. And I need to buy more vacuum bags. This entry was posted in Gardening, minnesota life, Wild Life. Bookmark the permalink. We, too, are being invaded.In the spring, I’ll need to deal with a wasps nest that is waaaay up high by the boy’s window. I have no idea what I will do about that. However, despite dealing with all of the rascals you are speaking of as well, I am hard pressed to envy the grasshoppers/locusts that invaded South Dakota in 1938 that were well over an inch or two long. My father drove through them on his way out west.They ate everything in sight.Then they ate each other! I’ll take these little guys any day.